Visible Ink Press : This superhero is the first to come from Snap City. This superhero is the first to come from Snap City. He was introduced to audiences as a reanimated corpse brought to life by Dr. Egon Boiffard. His superpowers include pyschic abilities. In 2000 he joined the superhero group The Atomics. Of the scores of new superheroes introduced during the 1990s, Michael Dalton Allred's Madman is one of the hippest and most stylish. Rendered in a simple yet expressive manner--running decidedly counter to the stoic, over-embellished, and exaggeratedly muscular style that became endemic to mainstream superhero comics--Madman's premiere issue (Madman #1, Tundra, 1992) gave the world its first glimpse of Frank Einstein, the man behind the mask of Madman. Allred's creation, beautifully colored by his wife Laura, was one of the first superheroes designed for the ironic sensibilities of twenty-something postmodern comics readers--an audience that would undoubtedly show little interest in standard superhero fare. Reanimated after death by Dr. Egon Boiffard and Dr. Gillespie Flem, a pair of mad scientists worthy of inclusion in the cast of Buckaroo Banzai, the man destined to become Madman awakens with almost no memories. Unable to recall his real identity, he adopts the name Frank Einstein (which sounds a little like "Frankenstein" if spoken too quickly); he also finds himself gifted with unpredictable psychic powers (including prophetic dreams and an intermittent sense of danger or security that Einstein describes as "spiritual inner eye awareness"), heightened agility, an apparently instinctual ability to survive being attacked, and an irrational hatred for beatniks. Clearly, Einstein's life isn't as simple as that of most mainstream superheroes. For starters, he is full of unanswered (and perhaps unanswerable) questions about his identity prior to his death. And being a reanimated corpse, he is rather unattractive. Einstein's personal insecurities and neuroses drive him to garb himself in a pajama-like white costume with a red lightning bolt/exclamation point motif; the outfit includes a white mask, intended for vanity's sake rather than for the protection of a secret identity. Despite his extraordinary abilities and his mask--worn only to bolster Madman's poor self-esteem--Einstein does not think of himself as a superhero. After Dr. Boiffard dies at the hands of Monstadt, a lunatic seeking immortality, Einstein embarks on a desperate quest to restore life to his friend and benefactor, while also fighting to rescue his girlfriend, Joe (Josephine Lombard), and Dr. Flem from some menacing monsters. Succeeding in his mission, Einstein discovers his innate propensity for heroism, and begins routinely defending Snap City--an ultrahip metropolis that lies somewhere between the 1939 World's Fair retro-futurity of Scott McCloud's Zot! and the skyline of the Mort Weisenger-era Superman (not to mention Allred's own post-Grunge Pacific Northwest milieu)--from every imaginable super-menace. Because of his death-addled memory, Snap City is the only place Einstein can even vaguely remember having called home; he loves the town, describing it as "a groovy place where just about anything can happen." Immediately dubbed "the Madman of Snap City" because of his weird, corpselike appearance and his strange turns of phrase (fairly typical of Einstein are such utterances as "Meanies never win. And you can quote me on that. "), Einstein finds himself regularly squaring off against rogue robots, late-show monsters (including a vomit-beast known as the Puke), and crazed beatniks, with a little help from gal-pal Joe and an alien called Mott (a native of the planet Hoople, a reference to one of Allred's favorite 1970s bands). Unlike virtually anyone else in the superhero trade, his signature weapons include a hollowed-out, lead-filled Duncan yo-yo and a slingshot, lending a fair amount of credence to the "Madman" moniker. 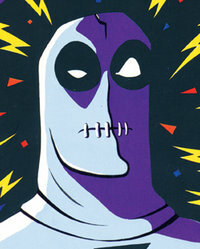 After producing six issues of Madman in a 1992 series for small-press publishers Tundra and Kitchen Sink (winning the 1993 Harvey Award for Best New Series), and three issues of Madman Adventures for Tundra in 1993, Allred took his concept to Dark Horse Comics, a haven for creator-owned properties since its founding in 1985. Dark Horse furnished Allred's stylishly bizarre hero with a much larger audience than ever before with a new series, Madman Comics, which debuted in 1994. Madman's new outing was well received despite frequent and lengthy lapses between issues, especially toward the end of its twenty-issue run (December 2000). Madman teamed up--and briefly switched bodies--with DC Comics' Superman in Superman/Madman Hullabaloo!, a three-issue miniseries released in 1997. Two years later, Dark Horse released Madman/The Jam, a two-issue miniseries that paired Allred and his character with another postmodern hero (with the participation of Bernie Mireault, the Jam's creator). After nearly dying at Monstadt's hands in the horror-detective yarn presented in Madman Comics: The G-Men from Hell (four issues, 2000), Madman became part of Snap City's first superhero group in The Atomics (AAA Pop Comics, 2000). Allred wrote and drew this title with obvious affection for the Silver Age (1956-1969) artistic powerhouse Jack Kirby, though filtered through a postmodern, somewhat tongue-in-cheek lens. In The Atomics, Madman finally makes peace with the beatniks he has fought over the years, and helps change several of them from alien spore-infected mutants into a fledgling team of mismatched heroes, nostalgically reminiscent of early issues of Marvel Comics' Fantastic Four or Avengers. Among Madman's new super-companions are the stretchable Mister Gum (better known by Snap City's populace, unfortunately, as the Booger), the Slug (a purple mutant with protuberant eyestalks), the Iron Man-like Metalman, and the enigmatic and acne-afflicted teenage time-traveler known as Zap-Man. The Atomics concluded its run in 2001 after fifteen issues. Unable to remain within the confines of comics and trade paperback reprints, Madman's likeness has found its way onto T-shirts, candy bars, lunch boxes, action figures, and even Zippo lighters. Hollywood has also taken notice of the character, with the release of G-Men from Hell (2000), a Madman-based film directed by Christopher Coppola (brother of actor Nicolas Cage and nephew of director Francis Ford Coppola), from a screenplay written by Richard L. Albert and Michael Allred himself. Various Atomics characters, and Madman himself, have returned for one-shots from 2002 to the present, and another, big-budget Madman film from director Robert Rodriguez has been in development since the early 2000s.